Kanye West held his big “Yeezy Season 4” fashion show event this afternoon on New York’s Roosevelt Island, and though people have come to expect flashy spectacles from him, West was all about business today. 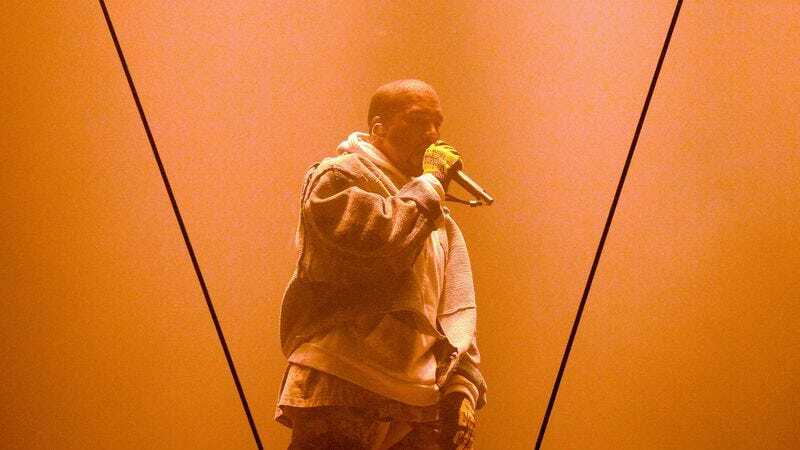 Rather than announcing a new Kanye West without a headphone jack or dropping new tracks (like he did when he debuted The Life Of Pablo during Yeezy Season 3 earlier this year) West decided to let his clothes do the talking—literally, because he didn’t do any talking. Really, given the expectations people have for whenever West does anything, this triangular fashion show was a whole lot of hype with very little payoff. That could be because the event started over an hour late, though. As it turns out, waiting for a fashion show to start is a surprisingly arduous process, which is probably why models tend to look so unhappy when they’re on the runway. West decided to pass the time by streaming the entirety of The Life Of Pablo while showing nothing but a glimpse of the New York Skyline. I used to love Kanye, I used to love Kanye. I even had the pink Polo, I thought I was Kanye. What if Kanye made a song about Kanye? Called ‘I Miss The Old Kanye,’ man that would be so Kanye. We also used to love Kanye, then he started his thing late. That’s so Kanye. Anyway, once The Life Of Pablo finished, whoever was running the stream just kept looping “No More Parties In L.A.” and then showed some clips of Kanye West fans talking about how Tidal brought them to New York to see the fashion show. They were very excited, and it seemed like it was probably a pretty cool place to be. Finally, though, about an hour and 40 minutes after it was supposed to, Yeezy Season 4 kicked off without any actual fanfare. Models just began walking down the runway, occasionally posing for a moment as other models inside the triangle stood still. The whole thing had an “oh, it’s happening now?” energy that carried through the whole event. There were a lot of tall boots and billowing fabrics, with models coming out in lines based on the color they were wearing. Meanwhile, the people in the middle continued to stand there, and after a while, it really seemed like there was some kind of metaphor in play about how some of the people were trapped in this triangle while others were free to wear Kanye West’s fashions and walk along the borders of the triangle. We’re not sure what it all meant, but near the two-hour mark, West himself finally appeared. He took a few steps along the runway, presumably readying some amazing speech that would lay out the themes and ideas behind his collection, and then—with a happy gesture off to the side—he turned around and ran off the stage. That was the end, and it was so Kanye. All in all, we’re not sure if we learned anything or grew in any way, but we did get to see some new stuff from Kanye West’s fashion line, and that should really be everybody’s goal every day. If you’re a Tidal subscriber, you can watch (an abridged version of) the stream yourself right here.